The craziness continues. HH was up at 4:30 today. She's scurrying around the condo like she's expecting dignitaries for dinner, but I know that's not true. 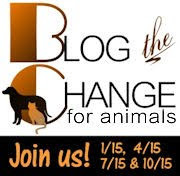 Oh... and don't forget to blog the change for animals... It's important. Oh my, all that cleaning going on at one time! Come over here, we don't have that problem!!! Well now we are all in suspense. Wonder what all that is about. We just cannot guess. Must be someone important coming. Can't wait for tomorrow. Take care. Looking forward to your news tomorrow. Hmmm - now this sounds exciting. Huh... it sounds like a mystery to us!!! We can't wait to find out what's going on!! Oh, we want to know! We want to know!! Okay, now you have to let us know what was going on...excuse my 'nosiness' but I'll be waiting! Tuna Tuesday is a wonderful thing!!! Mousey says,... Have a fun and easy Sunday!